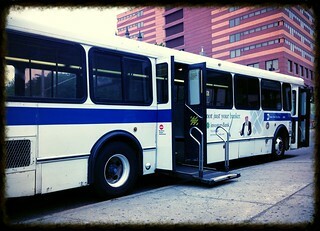 Q31: Orion V - MTA/NYCT Bus #6154 - Archer Ave/153rd Street, Jamaica, Queens, New York. Your Photographer was about to board this Q31 MTA/NYCT Orion V Bus #6154 from Archer Ave/153rd St, Jamaica, Queens, when the wheelchair lift jammed. This bus was out of service from this point on. Notice the "NEXT BUS PLEASE" sign near the front door. Picture taken on June 19, 2014.